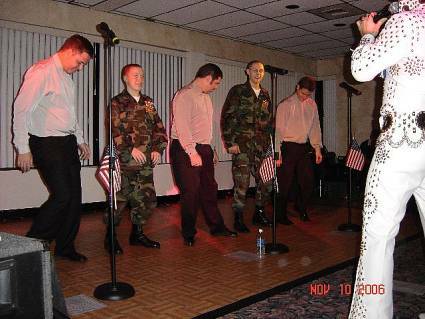 The Tri-City Young Marines Color Guard was invited to attend the annual Marine Corps League Ball at the Clover Island Inn on Friday, November 10, 2006. 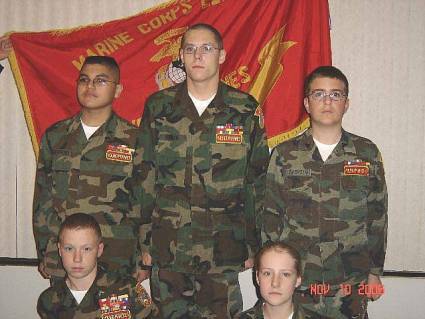 Young Marines Guerrero, Bowman, Chisholm (top row) along with Haeg and DeGraaf (front) proudly represented our Unit. 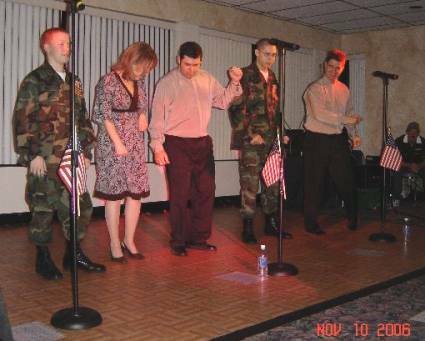 Just to let you know that all Color Guard duties aren't strictly "by the book", Young Marines Haeg and Bowman decide to show the audience how to "get down" and dance! 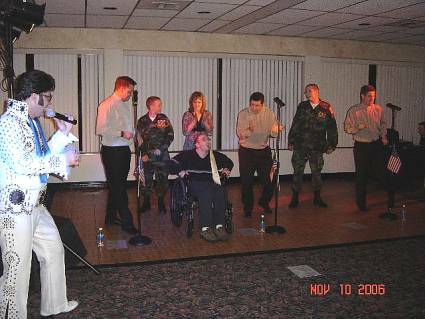 They must have shown they can dance, because Adjutant Mrs. DeGraaf decides to join in on the fun. Now the place is really hopping! John Haeg, obvious not pleased with the dance techniques of his younger brother and Bowman, gets on the dance floor and boogies! Just when you thouht Elvis was dead...here he shows up again. Do you think this photo will make us millions through the Enquirer? On a serious note, it was a great honor to be asked to attend this function. Thank you Marine Corps League for inviting us to this event. We would also like to thank each and very one of you for taking care of the United States of America. We appreciate all you have done for our Country and for us in our everyday lives. God Bless our Vets and God Bless the United States of America. OORAH MARINES!! !